The CF Series of hand chain hoists was designed for portability and durability. It's the economical and practical choice for efficient, trouble-free service. 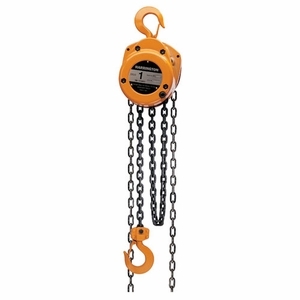 This is a long-lasting construction grade hoist that offers the best value in a hand chain hoist. A rugged die-cast aluminum body provides exceptional strength. Pre-lubricated sealed ball bearings make for a long service life and low maintenance costs. Weston-style load brakes provide positive braking action. In all, this hoist is designed with durable yet minimal parts for reduced maintenance expenses during the life of the hoist.